What you should know about Arm Pump ! A New Self-Therapy Option ! Arm Pump is a compartment syndrome not a blood flow issue! Turning the throttle, clutching and braking, the underarm muscles are in constant stress during a Motocross ride. During such an intensive activity the muscles increased their size and volume. The muscle itself is wrapped with a fasciae cover that – if not elastic enough - may hinder the muscle to extend and causes cramps (spasm) and arm pump. The increased pressure within the fasciae compartment leads to a disturbed blood flow which leads to a painful circulatory disorder. As soon you get of the bike the pressure decreases and the symptoms disappear. To prevent from arm pump you have to stretch your forearm muscles but most of all you have to keep the fasciae elastic and extensile. The only way to do so is outside mechanical pressure, which separates the fasciae from each other, and repositions them correctly as soon as the pressure is released. This treatment also increases your grip strengths dramatically without additional weight training of your forearm muscles that at the same time may increase the likelihood of arm pump additionally because of an increased muscle volume. 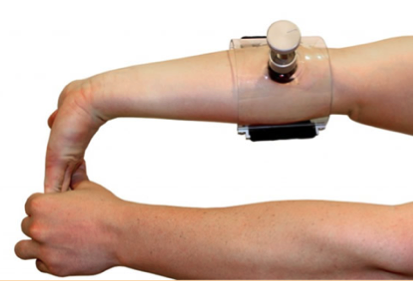 A brand new therapeutic option is the 4Arm Strong device it is a self-therapy medical grade appliance that allows anyone to expand and lengthen the fascia and muscles in the compartments of the forearm. Creating more freedom in the forearm compartments results in more grip strength and endurance, which is ideal for athletes and professionals that suffer from arm pump. 4Arm Strong is one of the easiest to use self-therapy / performance aids on the market. How to reduce Arm Pump and increase Grip Strengths? When certain athletes and professionals move their hand and wrist in a repetitive motion, or push and pull an object, they can experience tightness in the forearm and a loss of grip strength – that’s what we all call Arm Pump! It is important to understand that arm pump isn’t a blood flow issue; it is a blood containment issue. Many different activities can cause arm pump. Twisting a throttle and pulling a clutch are one of them. The energy required to perform these tasks attracts blood to the muscles in these compartments. When these muscles fill with blood, the fascia surrounding the muscles can restrict the temporary growth, causing a weaker grip. Fascia is a very stiff and constricting tissue. 4Arm Strong allows anyone to stretch and expand the fascia, allowing for blood to be increased in these muscles with less restriction. 4Arm Strong also effectively stretches the forearm muscles, which reduces their thickness, which will also decrease pressure. Increasing grip strength has many benefits. Better control of a motorcycle, enhancing a rock climbers’ ability to climb, improving an MMA or Jiu Jitsu fighter’s ability to control their opponent. Unfortunately these types of athlete should avoid strengthening their grip with resistance training because this can cause the muscles in the forearm compartment to become larger, thus increasing the risk of arm pump. 4Arm Strong not only increases grip strength, it actually reduces the circumference of the muscles because of the effectiveness of the stretch, so there is no risk of enlarging the forearm muscles. Use of the 4Arm Strong results in reduced arm pump, stronger grip and better hand and wrist function. 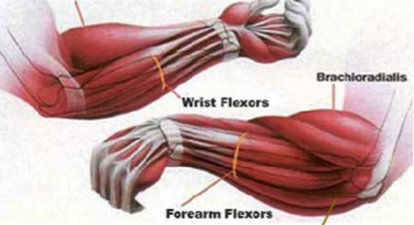 When the hands and wrists work with less tension, the entire body can function with less tension. It isn’t hard to see why trainers like Aldon Baker are so excited about this device! Seven Rider Management has been able to organize 20 units of this unique new self-therapy device from the US for an favorable pricing of € 179,00 including VAT which we offer exclusively to MX World Championship and EMX riders. First in first served: Sent us your order and we deliver personally at the next GP event in Assen/NL.